A pdf of 'A Matter of Justice' can be accessed here. Barely two years remain before the 2015 deadline for the achievement of the Millennium Development Goals (MDGs), yet it has become painfully clear that many of the targets set out in the MDGs will not be met. A new CESR briefing argues that the human rights framework can provide operational principles and standards of conduct to ensure the successor development plan delivers on its promises, however. By specifying what governments and other duty-bearers are already responsible for under international law, while also evaluating their actions and making provisions for ongoing participation and reassessment, a human rights approach can make sure the new development agenda avoids the shortcomings that have hindered progress towards the current MDGs. 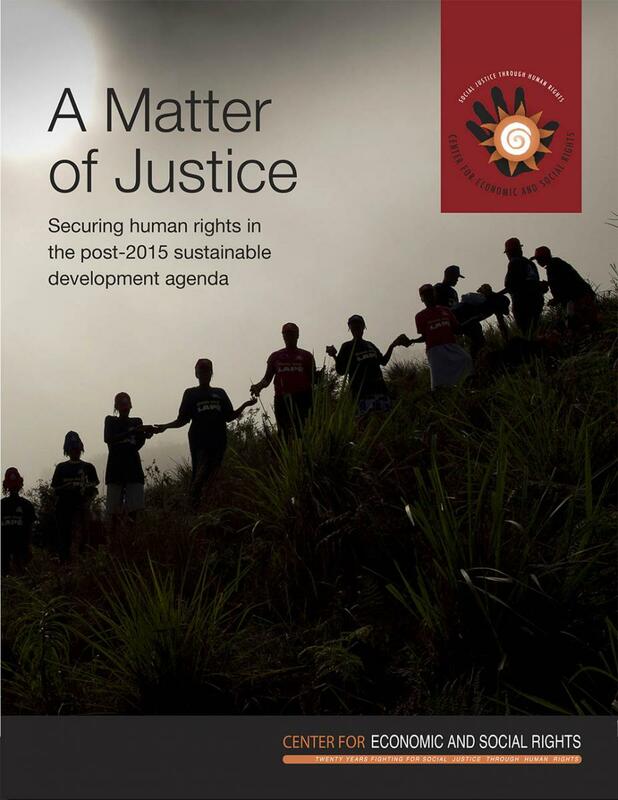 'A Matter of Justice' explains that the post-2015 agenda should be firmly rooted in nine key principles of the human rights framework: universality, interdependence, equality, participation, transparency, accountability, meeting minimum essential floors, using maximum available resources, and international cooperation. Governments are obliged to uphold these principles under international human rights treaties they have already agreed to be bound by. In practice, however, these obligations have by and large been overlooked in the design and implementation of current development commitments. This briefing argues that human rights principles provide concrete guidance as to how goals and targets are framed and how common but differentiated responsibilities are defined. They also set parameters for how the new commitments are implemented and resourced, how progress is measured and how accountability for the delivery of an effective and just 21st century sustainable development framework can be ensured. Taken together, these principles and standards can help ensure that the sustainable development commitments agreed in 2015 do not go down in history as yet another set of unfulfilled promises. To be sustainable, legitimate and transformative, the new development framework must enable an environment where active and empowered citizens can hold their governments and the international community to account for what they are doing to meet commitments made internationally. Reframing development in human rights terms is not only an ethical and legal imperative; it can also enhance the effectiveness and accountability of future development efforts. Ultimately, human rights principles - turned into practice - can be the normative building blocks of a fairer, more sustainable and more just development paradigm for the 21st century.